2) have moved to the mountains (or are visiting in the mountains) and see horseback riding (and possible future horse ownership) as part of the mountain experience. Most everyone wants to go on trail rides. Often a person will say, "I already know how to ride". Oftentimes one family member "knows how to ride" and has a more cautious/fearful family member that he/she wants to introduce to riding. Ironically it is often the second family member who quickly surpasses the first - in knowledge, skills and interest. Who Me? I can understand all of this because I grew up on horseback. I received my first horse as a birthday gift on my 7th birthday. (That's me on "Dolly" to the left.) Of course, as an adult, I myself thought I did not need riding lessons. 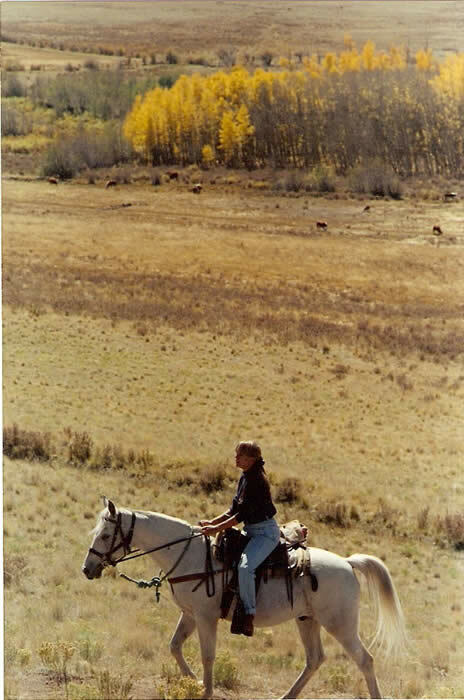 I was convinced I could train horses myself for two reasons: I could hang on to most anything and I was fearless. I definitely thought I "knew how to ride". After I took my first riding lesson (at age 35), I realized how little I actually did know. The more lessons I have taken, the more I realize I have yet to learn! The Joy of Learning. Horseback riding offers the opportunity for unlimited lifelong learning. It is a relationship with another living, feeling creature - one that, like ourselves, may be in a bad mood, be afraid, be touchy, any number of things. Every horse is different. Like any human relationship, there is no end to the potential for that relationship - one that maximizes the beauty and grace of the horse's movement and the partnership between the horse and rider. The study of dressage enables one to continually refine his/her learning and to apply it to a wide variety of horses. There are few things in life more satisfying than developing a relationship with a horse. Perhaps the one thing even more satisfying is teaching others how to develop an enriching, ever growing relationship with their own horses. Like human relationships, some people are satisfied with stilted, wooden, habituated, coerced relationships. Many horses are governed by force and/or bribes. I should know. It's the kind of relationship I used to have with horses. They did things because I could make them do them. Now I have eleven school horses that work by my side five to six days a week. They work hard for me - teaching people who are, often in the beginning, clumsy and unbalanced. Somehow the horses seem to understand the significance of their mission. They teach people to be more sensitive to horses - something that will affect every future horse that that rider comes in contact with. 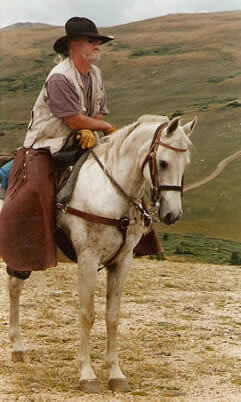 I've taken riding lessons for over 30 years. I've ridden horses for almost 60 years. If someone were to ask me if I knew how to ride, I'd say, "Well, I'm learning". It is MY learning that will help to open a lifetime of learning for you. The First Lesson. We cover a lot in the first lesson. To our knowledge, we have never given an introductory lesson to someone who did not learn a lot, regardless of his or her current level of riding. First come the preliminaries. Catching the horse and bringing him to the riding arena is a component of most lessons (the exception being when the horse has been used in the previous lesson). We teach basic horse safety, how to approach the horse, how to halter and lead him. We put the horse in cross ties, do some very basic grooming, explain about different types of saddles and bridles, how to select the right saddle for the horse and the rider and then how to tack the horse. We teach the rider how to mount properly, how to adjust the stirrups and the importance of sitting correctly in the saddle. Then comes the riding. We teach the rider how to follow the horse's movement with his hands, seat and legs, how to use these three aids in rhythm with the horse to influence the horse, to regulate his speed, to turn him in straight lines and circles. Generally the first lesson is confined to the walk and to the indoor arena. Rare is the rider -- regardless of experience level -- who can in fact -- in this first lesson -- keep the horse rhythmically walking in a straight line along the wall, turn at one letter and walk straight to the next letter and walk in a round circle of prescribed size. We usually also teach adults a few steps of the leg yield, getting the horse to move sideways from the rhythmical pressure of the rider's leg. To read more about how we teach "feeling" in the very first lesson, click here. Seat Lessons. I am apt to spend more time than Jim on the rider's position, teaching him/her how stiffness, tension and imbalance affect the movement and well being of the horse. Riders delight in my seat lessons - where I control the movements of the horse in a circle around me. The rider is free to devote all of his/her attention to his/her position in the saddle. I see developing the rider on the lunge line as similar to sculpture. I have a specific idea of what I want to accomplish. I work with the rider to develop the flexibility and strength to attain that picture. Much of the flexibility and balance I am trying to achieve relates to beauty, poise and relaxation in general. There are remarkable changes in the grace and beauty of both horse and rider as a result of my lunge lessons. The United States Dressage Federation (USDF) recommends one lunge lesson per week for every rider at every level - including Olympic-level dressage riders. We as trainers become unbalanced and tense ourselves without attention given to us by an instructor with a horse on the lunge line. Click here for more information on seat lessons. Expectations. 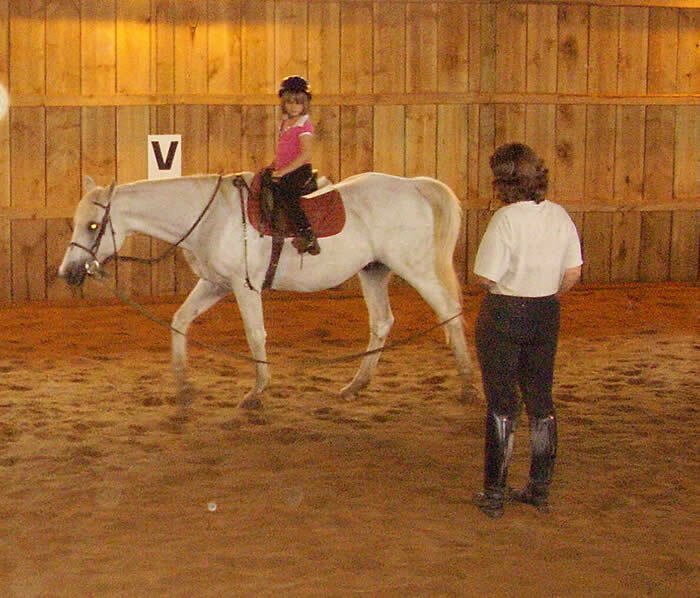 In the first four lessons, students age seven or over generally learn to post the trot. 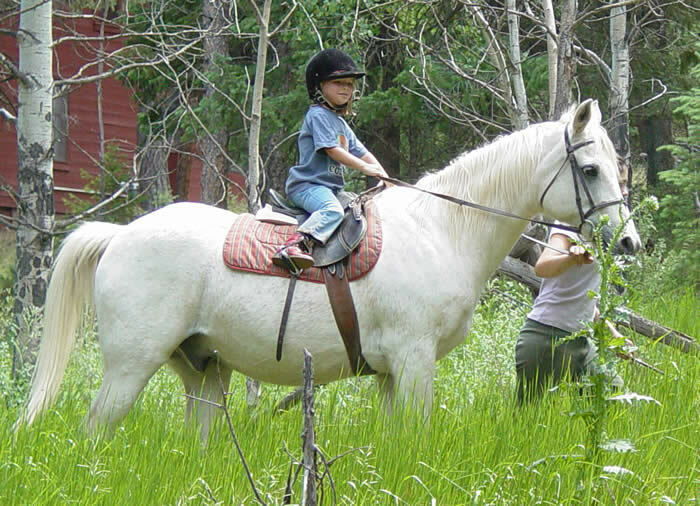 Within the first ten lessons, an adult or older child generally learns to ride the canter. There is a great deal of variation among riders in the following: confidence, coordination, ability to follow instructions (I call this having the ear hear it and the body do what the ear hears - personally not an easy thing for me), strength, flexibility, sensitivity, perseverance and the desire to learn in depth or superficially. How Many Lessons Will I Need? We are often asked this question, but the answer is really up to the individual. We have had many students take lessons with us for eight years or more. On the other hand, many people buy horses after having taken virtually no lessons at all. It is all a matter of the quality of experience you wish to have with horses. The more lessons you take on the largest number of horses the better prepared you will be to successfully ride a horse of your own. The more lessons you take, the more you will be able to improve any horse you ride. Foundations of Horse Training. The purpose of horse training is not just to make the horse submit to the will of the rider but to enable him to carry a rider with all of the grace and agility that he can move on his own. (In time we even improve the horse's natural movement!) Essentially this means developing the weight-carrying strength of his hind legs and his back. In training we use circles and turns, halts and lateral (sideways) movement to develop the strength and suppleness of the rear end of the horse. It is extremely important at the same time to develop the balance, strength, sensitivity and timing of the rider such that he helps rather than hinders the horse's movements. Trail Riding. Sometimes a student will say, "I don't need to learn all this stuff in the arena. I just want to go trail riding." 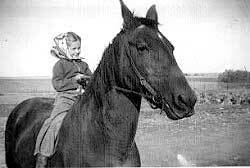 That might make sense in an Iowa pasture where I learned to ride. However, there are few flat, wide places in the Colorado Rocky Mountain wilderness. Trails consist of narrow places, sharp switch backs, drop offs, low hanging branches, trees or boulders close to the trail, steep up and down hills, poor footing and difficult rocky creek crossings. It takes skill to navigate these places - even with an experienced trail horse. It takes quite a LOT of skill to navigate a horse with little or no experience. 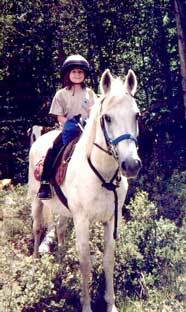 When we have taken riders on trail rides in the Rocky Mountain wilderness, we wanted to be fairly confident that the horse and rider were functioning as a team and that the rider would have at least some control in unexpected situations. Growing Up With Horses. Many parents tell me what an important role horses have played in their children's lives. They give the child self-esteem and focus. There is opportunity for social interaction in the stable. Working with horses provides such a healthy outlet for kids in today's world. Generally parents do not appreciate the role of horses until the child enters the turbulent adolescent years. It is often too late at this point to get them started with horses. I advise parents to nurture their young child's interest in horses. Horses will then provide a stabilizing influence for them when they enter their more difficult years. The skills that a child learns can be applied to other life challenges as well and will stay with the child throughout his/her entire life. Click here for a presentation made to the American Youth Horse Council. 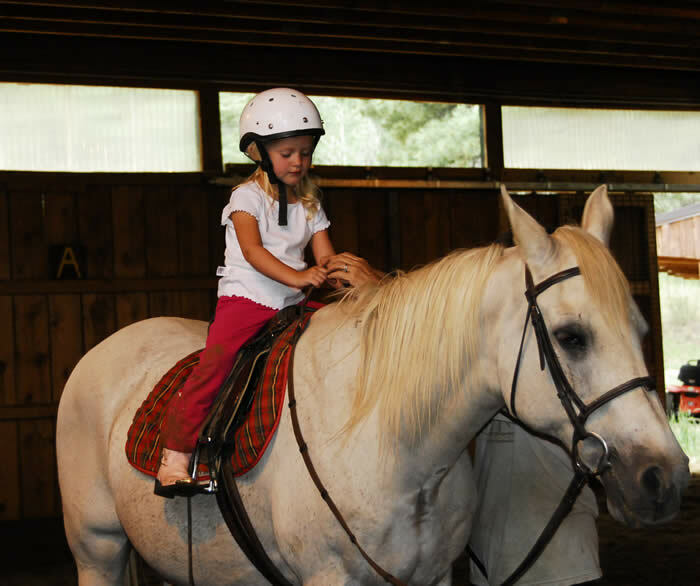 If you missed out on riding lessons as a child, it's not too late to start now! Please join us at Anchorage Farm! Am I too old to learn how to ride? Please note that we do have a 230# weight limitation for people who ride our school horses.